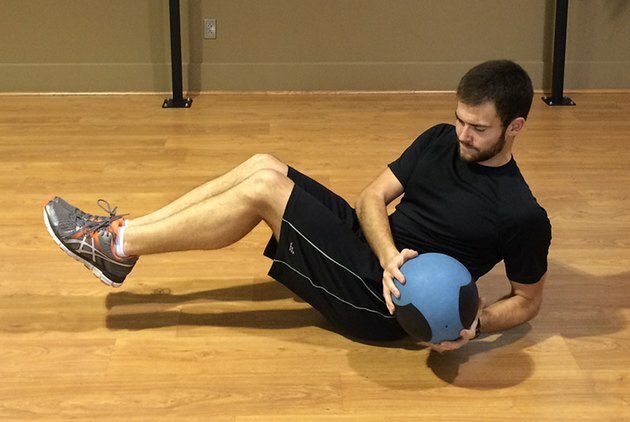 The traditional sit-up gets an upgrade when you use a medicine ball to add extra resistance. You'll feel more challenged as you build stronger muscles. The shape of these weighted balls makes them perfect for tossing or hugging as you raise and lower your torso. Medicine balls come in varying weights and sizes; those appropriate for ab workouts are usually between two and 25 pounds and are shaped like a basketball. The weight of the ball you choose should feel challenging and slow your movement down, but shouldn't cause you to feel out of control or compromise form. Instead of counting repetitions when you do these exercises, set a timer and perform each for a minute to fire up your core. Take 30 or 60 seconds between them to give your abs a chance to rebound before being worked again. Use a medicine ball to augment the classic situp in one of two ways: add resistance to the upper body by hugging the ball or anchor the feet by squeezing the ball between your ankles. Lie down on a mat and bend your knees. Plant your feet in the floor. Hold the medicine ball between your hands at your chest. Lift your head, neck and shoulders up off the mat and simultaneously push the medicine ball straight up. Squeeze your abdominal muscles in towards your back and exhale as you rise. Your arms remain extended throughout the movement so that when you reach the top, they're near your ears and the ball is extended just over the crown of your head. Return to the starting position to complete one repetition. Sit down on a mat with your knees bent, feet planted in the floor. Select a 10- to 16-pound medicine ball and place it between your feet. Engage your abdominal muscles, hold your arms crossed over your chest and squeeze the ball with your ankles as you slowly lay down on your back. Continue to raise and lower your torso, using the ball to pin your legs down on the floor. Consciously feel your abdominals hug in towards your ribs to activate the muscles. Why work out alone when you can harness the energy, motivation and fun of a partner? A partner can provide morale support and throw the ball to you as you perform situps. If both of you want a workout, have your partner get down on the floor and do the situps with you. Lie on the floor with your back in a mat and bend your knees. Hold a medicine ball in your hands just in front of your chest. Have your partner stand facing you. He'll place his feet on top of yours, gently, to keep you from swinging your legs during the exercise. Engage your abdominal muscles in toward your spine as you raise your torso and toss the ball to your partner who will throw it right back to you while you're still lifted. Lower your back to the mat and repeat for the desired number of repetitions. Sit on the floor and face your partner with your feet about 12 inches apart. Both partners bend their knees. One partner holds the medicine ball. The partner holding the ball lowers down bringing the ball behind his head, tapping it to the floor. As he rises, he tosses it to his partner. The partner catches the ball and immediately lowers herself to the mat, letting the ball tap to the floor over her head. She then rises and throws the ball back to the first partner. Continue to toss the ball back and forth to complete the desired number of repetitions. This move is a crunch rather than a situp. A crunch uses abdominal muscles only while a situp activates stabilizing muscles of the neck, thighs and hip flexors. Lie on your back on a mat and hold a medicine ball between your hands. Extend your arms so you're holding the ball above your chest. Lift both legs up toward the ceiling. Keep them pressed together and straight with your feet flexed. Keeping your arms extended and hands gripping the ball, raise and lower your shoulders up off the floor. Let the ball tap your ankles or toes as you lift up. Go Ask Alice: Medicine Balls for Exercise?